The chance to own a watch with real cultural significance is one that doesn’t come around as often as we might like. Historically important design icons tend to have hysterically impossible price tags. The Day-Date is a crowd-stunning watch. 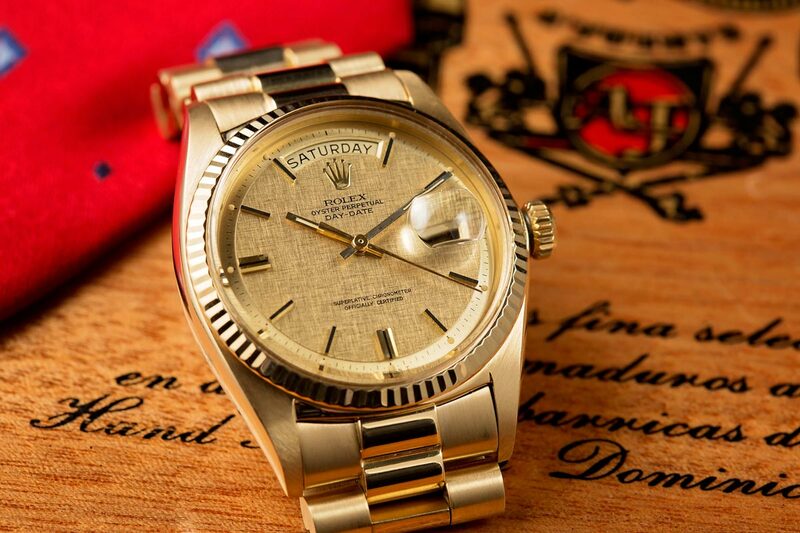 There are, of course, exceptions, and the Rolex Day-Date is one of them. A model that has been with us so long it has become an accepted part of the landscape, the President’s watch has been the crown’s crowning achievement since its launch back in 1956. Stealing the Datejust’s place at the top table, a piece itself still in its infancy, the Day-Date became not only the first watch in the world to display the date as well as the day of the week written out in full, it brought also a new, tastefully refined bracelet specifically designed to complement its elegant profile. Over the years, the President has lived up to its nickname and been the go-to choice for leaders across every field, with a range of styles in enough different colors and precious metal combinations to appeal to everyone from hip hop artists to commanders-in-chief. Happily though, the Day-Date has now been in constant production for over 60 years, each one made with Rolex’s typical obsessiveness to engineering excellence, meaning the pre-owned market is awash with examples in superb condition and at prices that are surprisingly attainable. With so many models to choose from, and with the level of diversity in their design, you will find examples to both lust over and loath. The question is; what can you get for your money? The prices of the Day-Date vary widely starting at 5k. What Does a Day-Date Cost? Steel has never had a place in the Day-Date story. The President has always been made from the finest gold and platinum, with even the half and half compromise of Rolesor or Rolesium unable to sneak in while its back was turned. Not only does that enhance its reputation as the ultimate dress watch in the Rolex lineup, it makes each model a great investment piece. While prices of precious metals may fluctuate in the short term, gold especially has always been an excellent hedge against inflation. So, while the initial entry price to the Day-Date family might be slightly higher than, say, a Rolesor Datejust, its value is assured. Below, we’ll take a look at some of the different price ranges and what each one will buy you in Presidential timepieces. A vintage Day-Date retains its price. It usually comes as a very pleasant surprise to people starting out on the search for their first Day-Date, considering not only its costly construction material but also the history and provenance of the model, just how inexpensive the buy-in can be. In the $5k-$10k range, you will discover all the watch you’ll ever need. Exquisite examples of one of the most opulent pieces Rolex has ever made, at a fraction of the retail price, and with a design that looks practically identical to the ones currently rolling fresh out of the gates at Geneva. Representing particularly good value, the ref. 18038 was first seen in 1978. This was the model that introduced the sapphire crystal to the range, along with the convenience of the Quickset date function, powered by the new Cal. 3055. It served as replacement to the long-running ref. 1803, a 20-year veteran that had sold countless numbers and put the Day-Date on the map. You should pick a Day-Date that best fits your lifestyle. You will find superb examples of this older watch at this price point too, instantly recognizable from its successor by its acrylic crystal as well as the pie pan type dial common to all 1803s. One model that looks strikingly different to anything else in the Day-Date series is the ref. 19108, or the Oysterquartz—Rolex’s grudging response to the crisis that took down most of the Swiss mechanical industry in the 1970s. To this day the most accurate watch the company has ever produced, the styling of the Oysterquartz is very much of its time and something of an acquired taste. But interest in this fascinating footnote in the Rolex saga has been growing lately, steadily pushing up prices and tempting more people to secure one as an early investment. Some Day-Dates are significantly higher its other counterparts. Taking the leap into solid five figure territory brings things right up to date, with some of the more contemporary Presidents now within reach. 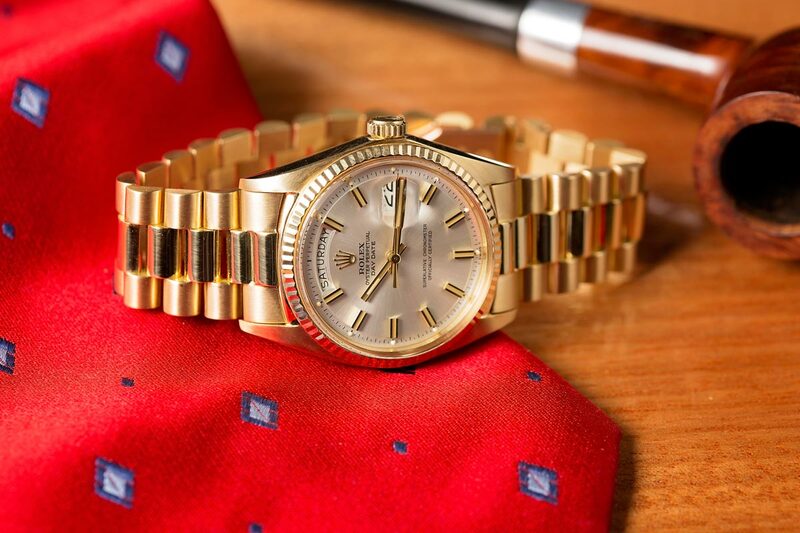 Along with a slew of traditionally sized 36mm models, in all three flavors of gold as well as the glorious shimmering whiteness of Rolex’s 950 platinum, the two versions that marked the biggest shakeup to the Day-Date’s design in its six decade history are also prevalent for between $10k and $20k. 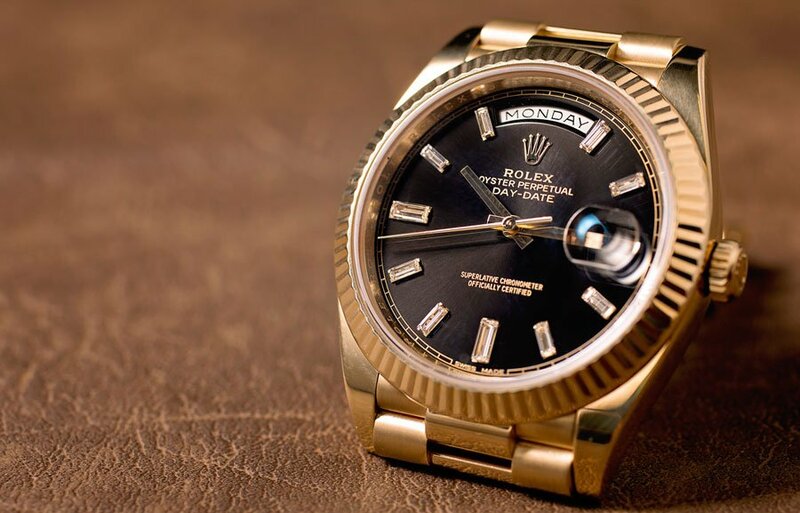 The short-lived 41mm Day-Date II and the current Day-Date 40 were Rolex’s answer to the modern trend for larger watches, with many potential President buyers seemingly put off by the relatively modest size of the original. Although the single millimeter difference between the two might seem insignificant, in reality, their comparative proportions make a much bigger impact. The Day-Date II, released in 2008, has sacrificed the design’s usual restrained slenderness and added a muscular bulk to its bezel and across its broad shouldered lugs. This Day-Date his a diamond dial. 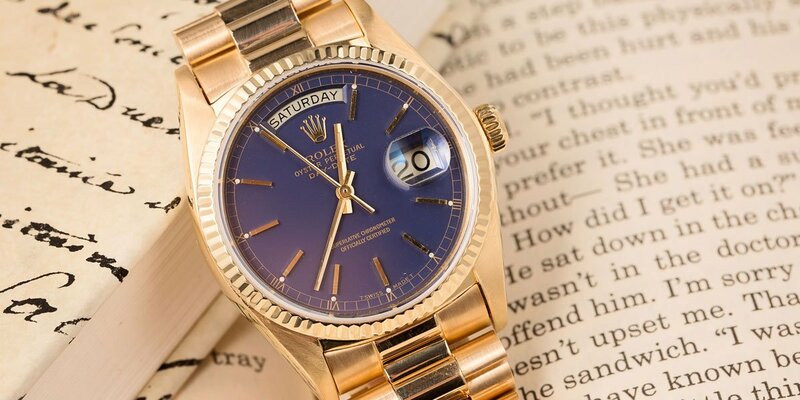 The Day-Date 40, which debuted in 2015, is very much of the old school—an enlarged version of the age old archetype that retained the much-loved silhouette. While the Day-Date II’s newfound sportiness proved too big a leap for many of the brand faithful on its release, it’s size and rarity value has made it a desirable piece on the pre-owned market, ticking all the boxes avid collectors look for in an investment; unorthodox, limited in number and destined for future classic status. On the other hand, the Day-Date 40 is simply the result of six decades of hard work and constant improvement. The recipient of a next generation movement, the Cal. 3255, it sets new standards in precision, shock resistance and reliability, and boasts a 70 hour power reserve, all protected by 14 separate patents. 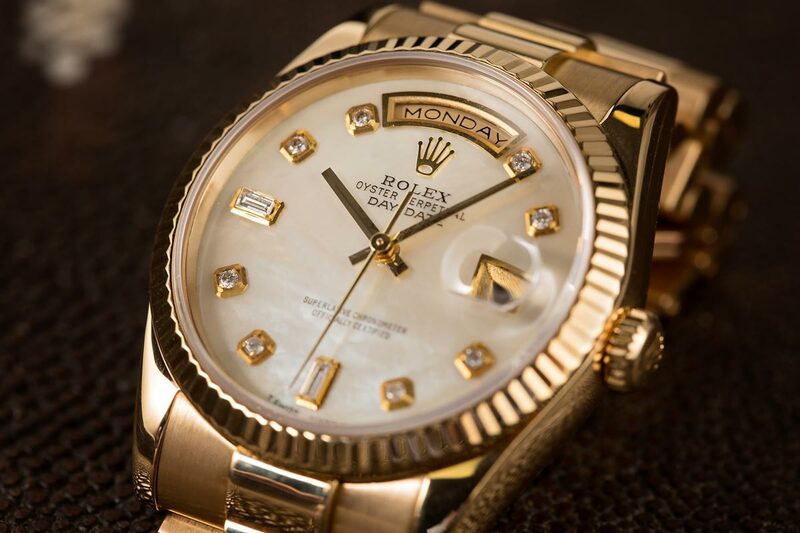 It is the ultimate version of Rolex’s flagship, and solid gold examples are easily found in this price range. Day-Dates have a variety of different looks. A special auction in 2015 to celebrate the Day-Date’s 60th anniversary saw an average price of over $100,000 paid out for some exceptional examples of the watch. The most expensive lot of the evening sold for around half a million dollars, confirming there’s very little in the way of an upper limit in what people will pay for a President. Sticking at the more reasonable end of the scale, this price range buys you an awful lot of watch. The impossibly cool ref. 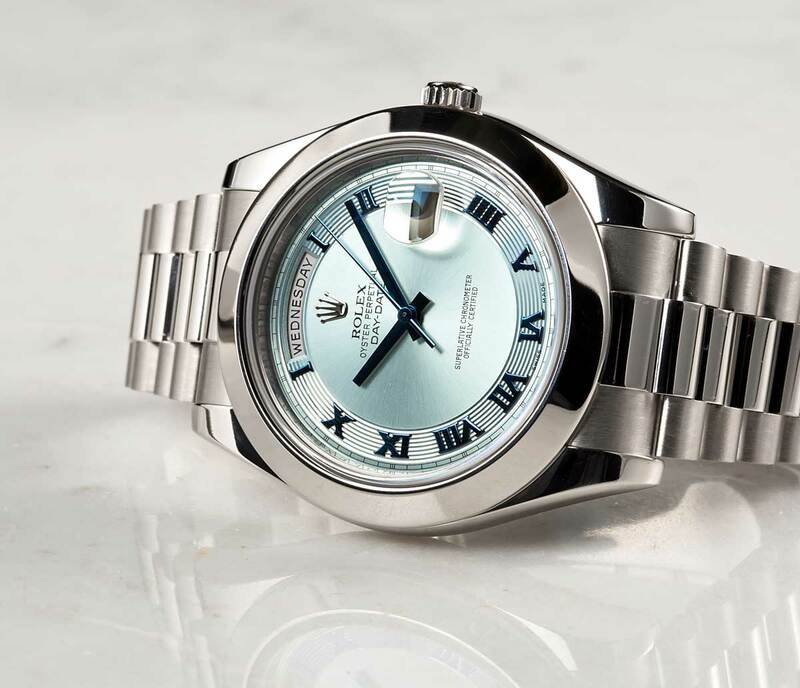 228206, the latest 40mm model in platinum with an ice blue dial, is one of the most eye-catching variants Rolex has ever devised; a thoroughly modern take on an ageless design with an appeal across the sexes. 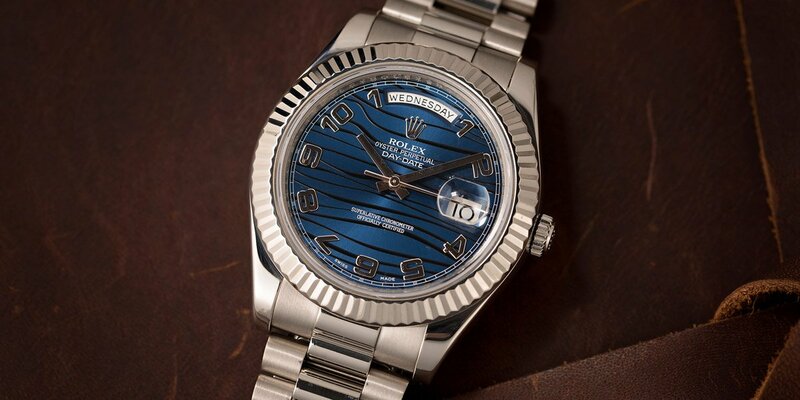 A similar notion but different interpretation, the Rolex ref. 228235 comes in Rolex’s own Everose, topped with a rich chocolate dial. The radiance of the sunburst pattern face and the glow of the pink gold give the watch an incredible warmth, and the two examples are like summer and winter. You can also expect to find some glitzy showstoppers in this neighborhood, with gemstone-heavy dials and bezels that transform the usually conservative brand patriarch into an unapologetic exhibitionist. Worn by very few librarians, they are watches solely for those comfortable taking center stage. Whether you take it to the beach or the party, there is one for you. The President has been with us a long time and will continue to be the watch that the world’s most driven aspire to for generations to come. Its beauty lies in its simplicity—it does all you could ask for from a luxury timepiece with the minimum of fuss, and with enough difference in styling options to satisfy anyone’s tastes. The one you choose will be dictated by personal preferences and budgets, but whichever model ends up in your collection, you will not be disappointed; there really is no substitute for a Rolex Day-Date.